Not really a winter walk, maybe more of a stroll ! Dedham is famous for being at the very heart of “Constable Country”, where the artist John Constable painted his iconic pictures. In the summer it throngs with visitors, but in the winter months it’s much quieter. During the summer months, many visitors enjoy the walk across the fields by the side of the River Stour from Dedham to Flatford and back. It’s one of the most famous walks in the country, appearing in many walking guides. The landscape is quintessentially English, and thanks to it being designated an Area of Outstanding Natural Beauty, little changed since Constable painted it. However, on a cold and muddy day in winter a walk across the fields may not appeal to everybody. 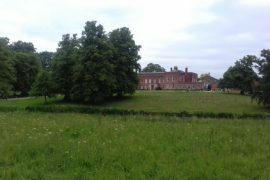 So, here’s a walk that I often take visitors to Dedham on who want to see the buildings, soak up the atmosphere, and maybe visit a pub or tearoom for something to eat. We did the walk on a chilly day in January yesterday (pictures below). You can stay on footpaths for the whole of the walk, with just one short slightly muddy footpath to negotiate. You can park in the High Street for free for up to two hours, but if you want to stay for a bit longer park in the car park in Mill Road, where there’s a small charge. For this walk that’s where we parked. When you leave the car park turn right. Opposite you on the other side of the road is Dedham Mill, which at one time was owned by Golding Constable, John Constable’s father. Whilst he was young John Constable worked with his father who was a very successful miller and businessman, and was known to the locals as “the handsome miller”. Cross the road (carefully!) 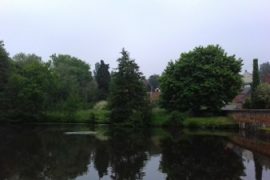 and just past the mill is a short footpath which will take you to Dedham weir and lock. In January there is often water roaring through the weir into the mill pond. You can walk across the bridge to view the lock which appears in many of Constable paintings. If you have stout shoes on you can then walk to the right around the mill pond in a circle to return to the main road, or else retrace your steps. Cross the road to enjoy the glorious view across to Flatford. Now walk into the village, with the car park to the left. You will arrive in Royal Square. The square is dominated by the glorious parish church of St. Mary’s. It’s one of the East Anglian wool churches, built by local wool merchants to show off their wealth and to praise God (probably more of the latter!). If you get the chance – and the door is usually open – pop inside to have a look. There are modern oak carved pews which I particularly like, and there’s also “The Ascension“, an altar painting by John Constable, to admire. An original Constable in the heart of an Essex village! When you leave the church walk across the churchyard to the gate that takes you out in to Royal Square by the war memorial. If you look closely at the memorial, you will see included are the names of a mother and her child who died during a 2nd World War bombing raid. The house on the corner is the Old Grammar School. Have a look to the right of the door – you can see the initials of some of the school children carved into the brickwork. Maybe John Constable’s initials are there somewhere! If you continue across the field you’ll arrive at Southfields. It’s a pink washed timber framed building, dating from the wool trade in the 15th and 16th century. It’s so quiet now, but this was once the centre of the wool industry in Dedham. From here, there are footpaths that you can follow across the fields, to take you back to the village centre, but it’s quite a muddy route in the middle of winter. From here you can also continue the walk along the lane to the left to Castle Hill. You can stop on Castle Hill to admire the almhouses, and then retrace your steps. Or you can walk up the hill and and after a five minutes you will arrive at Castle House, now Munnings Art Museum. It’s the former home of the artist Alfred Munnings, and is open from April to October (and has a cafe). 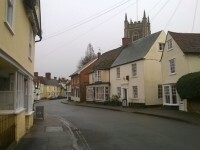 Back into the village, you can explore the half dozen or so shops on the High Street. If it’s refreshments you’re after there are a few choices. There’s the Marlborough pub on the corner, although our recommendation is The Sun Inn, that has good beer and great food. There’s the Dedham Craft Centre, where there are lots of craft stalls over three floors and a tea room, which is good for hot meals or tea and cake. There are lots of houses to admire (they look even better in the summer when the wisteria is out! ), and plenty of other lanes and footpaths to explore. If you are planning a to visit Dedham with a group and would like to arrange a walk for them I am a Blue Badge Guide and regularly lead walks around the village for groups. You can contact me here, if you would like to book me for a walk for your group.